Slated for launch in the autumn of this year, CITIZEN unveils three new "Caliber 0100" watches, named after the Eco-Drive movement, that delivers the world's most precise time-keeping accuracy of within ±1 second per year. This year's centenary marks Citizen's pushing technologies to extreme limits of precision time-keeping to a world's first accuracy of ±1 second per year. "Caliber 0100" represents its most innovative drive movement and the brand's drive to evolve watch manufacturing to a new world-leading level. In order to achieve such unprecedented accuracy, "Caliber 0100" utilises AT cut type crystal oscillators rather than traditional tuning fork-shaped crystal oscillators most often used in quartz watches. AT cut type crystal oscillators vibrate at a frequency of 8.4 MHz (8,388,608 Hz), which is more than 250 times higher than tuning fork-shaped crystal oscillators. This ensures that this new mechanism remains resistant to outside influences such as temperature fluctuations and effects of gravity, as well as age degradation. AT cut type crystal oscillators, however, require greater amounts of energy to operate. Citizen was able to compensate for this by thoroughly vetting materials used, intelligent designs, and refined control over its power-saving strategies. "Caliber 0100" technology allows Eco-Drive to run continuously and is significantly more stable for up to six months on a single full charge (8 months on power save mode), even without the presence of a light source. What's more, "Caliber 0100" maintains its greater accuracy by continuously monitoring and adjusting for frequency and temperature shifts once every minute. The optimal running temperature is between 5°C to 40°C, which is considered the most practical watch temperature environment for most regions of the world. Among the most impressive characteristics is the perfect alignment of the second hand and indices when viewed from the front. Individual hand movements are the physical expression of a "second in its purest form," achieved by adopting the LIGA fabrication process (a fabrication technology for making high-aspect-ratio microstructures) for individual components. Ordinarily, gears and springs are machine cut and pressed. With LIGA fabrication, more intricate components can be manufactured. Special components made by combining customized springs and gears processed by LIGA fabrication prevent even the smallest inconsistencies of gears to control hand movements, and enables hands to align perfectly with the indices. For the watch hands, heavy and long brass elements are utilised, which ordinarily cannot be propelled with traditional torque motors of quartz movements. The simple aesthetics of the brass hands featured in these new models reflect the design concept of "conveying the purity of every second with superb accuracy." 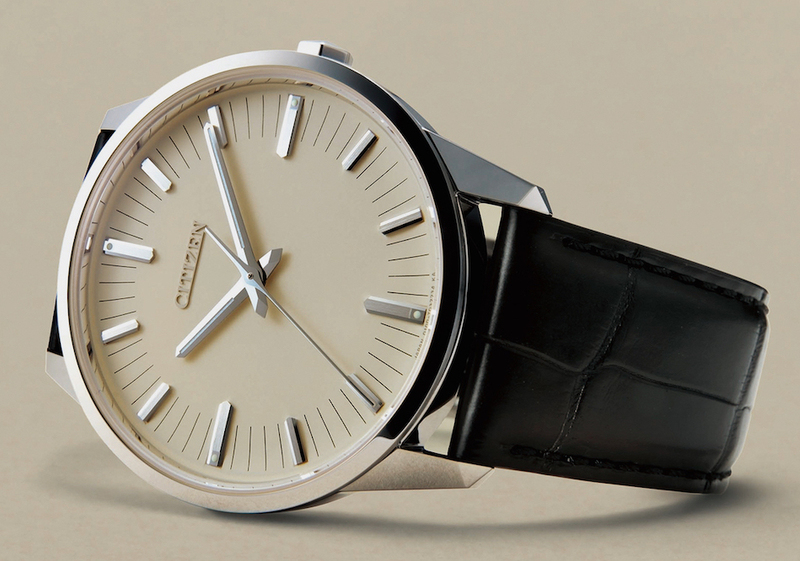 Citizen's own skilled watch-making meisters are responsible for assembling "Caliber 0100." These master crafts people oversee and ensure the highest quality and accuracy of the brand's watches. They are also entrusted to ensure precision alignments of the second hand with each of the 60 indices once it is set in. The case, in 18kt white gold, measures 37.5mm x 7.1mm. It has double AR-coated sapphire crystals and it is water resistant to 50 meters. The "Caliber 0100," incorporated in the white gold case, is made of a black, discolouration- and corrosion-resistant ruthenium plated material, with a unique striped finish visible on the back of the watch through the sapphire glass. The tip of the second hand and the edge of the ivory dial create corresponding arcs, enhancing the second hand movement that perfectly aligns with the indices. It comes on a black crocodile leather strap. The case, in Super Titanium with Duratect, measures 37.5mm x 7.1mm. It has double sapphire crystals and it is water resistant to 50 meters. 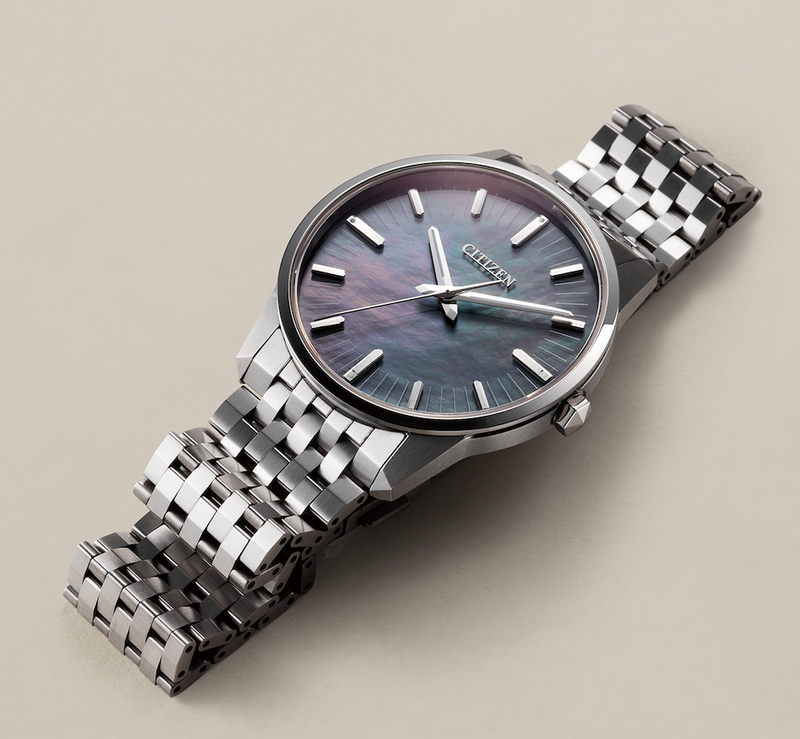 AQ6021-51E comes with a metallic black dial and AQ6020-53X comes with a mother-of-pearl dial. then it's doomed, at least to me this minimal design is just too minimal for its price. Sorry disagree. There a lot of Patek's out there with as simple a design as this Citizen that cost three plus times as much. Really like the design. That's a crazy amount of cash for what it is. And while I admire GS, and have owned a GS quartz, this one is very nice but the pricing is, ahem, aggressive to say the least. I can get the same or better accuracy for $6,340 by picking up a Casio Wave Receptor at Walmart as I get the signal from the atomic clock almost every night of the year with no difficulty. I wonder how well these Citizens will actually sell. ...tone deaf to the competition in that price range. I agree there are many minimalist designs out there. But this one is (in my judgement) too similar to the other Citizens in my local department store. paying that sort of price then every day seeing a jumping second hand and the big letters that spell "Citizen" don't fit together in my mind. Snobbish for sure, I suppose. Guilty as charged, but that doesn't change my mind. And it looks like a lot of Citizen watches at the mall that sell for under $200. Perhaps they should follow Seiko's lead and call it Grand Citizen to justify the higher price. But Nomos, even Mondaine do it better than this. When this movement finds its way into a 'The Citizen' I'll take notice. It's also a lot more expensive than a Grand Seiko 9F quartz watch. added to Seiko. The GS watches more than justify the price by the quality provided. I suppose this does too, from a technical perspective, but wow what a high price! This movement really needs to be showcased in a watch with better design. 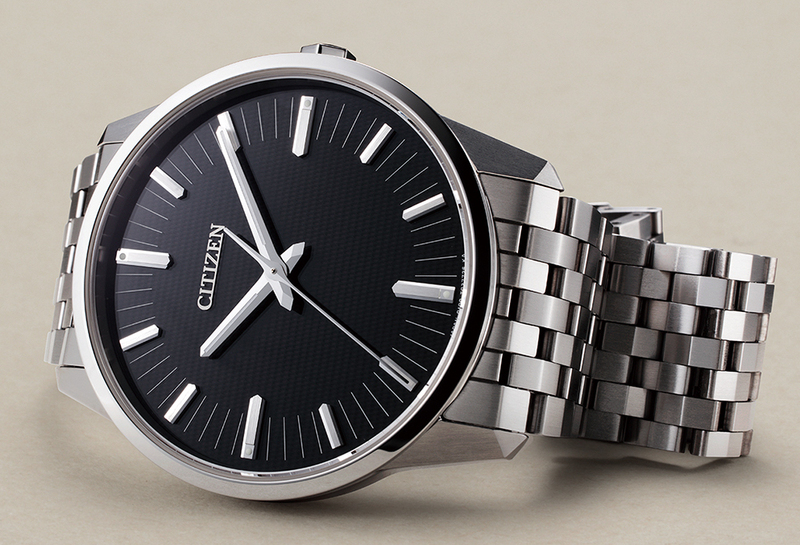 From Citizen, it should be featured in a Chronomaster. I like the titanium case & bracelet, but it needs to look nicer to justify the price. I'd rather have a Grand Seiko 9F or The Citizen model for better overall design. Maybe if you move the decimal point to the left by a digit. That's a huge chunk of change for a Citizen, irrespective of record breaking stand alone accuracy. Interacting with and setting our watches is half the fun, it just sitting there working to ultra high precision is a bore. Just to clarify for those who remark that inexpensive Casio Waveceptors and other radio controlled watches are as accurate as these expensive Citizens (or Citizen Chronomasters and Grand Seiko quartz for that matter), the atomic clocks are all in the northern hemisphere and the radio signals from the atomic clocks in Asia, the U.S. or Europe only cover a portion of the northern hemisphere; there's a large area that's too far from the transmitters. The entire southern hemisphere, except for some places near the equator, is out of range of these northern atomic clock signals. This includes Australia, Africa, South America, the Middle East, and especially the massive population centers in India and Brazil. So there is a need for accurate watches that are not atomic clock dependent. The GPS controlled watches from Citizen and Seiko that run in the range of $1K to $2k USD is an answer to this, but frankly, they are still "big, honkin', fugly watches". To say they lack elegance is an understatement. From my own experience at owning multiple Casio Waveceptor models, when the watches cannot synchronize with the atomic clock signal, due to distance or weather, they actually perform WORSE than standard quartz watches (which are usually rated at +/- 15 seconds per month). Hopefully, these movements will trickle down to the more standard lower-priced Chronomasters, but the advanced manufacturing technologies used will probably always make them more expensive than standard Chronomasters and Grand Seikos. It's interesting that they make special note of the increased power consumption of these movements and the fact that they eliminate the date feature and thus the perpetual calendar complication, which sets Citizen Chronomasters apart from Gran Seiko movements (which do not have a perpetual calendar feature). It's understandable that if you want to save power and make a thin watch you would eliminate the date feature; turning the date wheel over every day no doubt uses a surprising amount of power. And it's funny how everyone comments on it being too expensive; I believe the LE's will all sell out easily, and once they put this movement into some non-LE versions, I am sure the prices will all come down (but probably still in the thousands, just like quartz Grand Seikos). Next Topic: FRIDAY - WHAT'S ON?